Qixen-P Design Zgiga TV | OhGizmo! I usually don’t like to post concept ideas because quite frankly, most of the time it’s something I really want and will never be able to buy. However I’ll make an exception for this concept TV/entertainment center because I think it brings some interesting ideas to the table. While the designer won’t win any awards for an easily marketable product name, I think they’ve come up with a great solution to dealing with the multiple components that make up a usual entertainment centre. Instead of wasting floor space by stacking them in a piece of furniture, why not mount them to the wall like most LCD and Plasma TVs are these days? 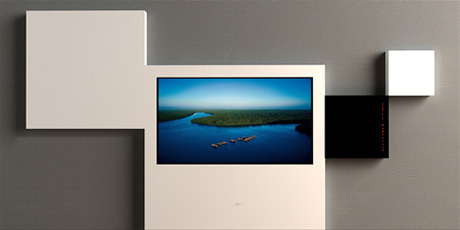 In this concept, the black box to the right of the screen houses a DVD player for example. As long as the individual components maintain a similar design aesthetic, the layout on the wall ends up being a piece of art in itself.